Last week Tom asked me if I wanted to come along and take some pictures of the new indoor Paintball Gent location on the day before the inauguration (you never know if this term brings an extra visitor to the blog). 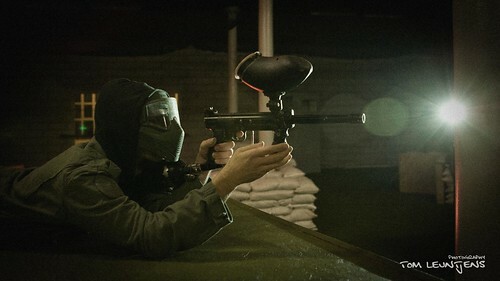 Although I did take a lot of gear with me I was totally under prepared for the awesomeness (and coldness) of the new paintball hall. Tanks, gun turrets, churches, bunkers, sandbags … it was like landing in Normandy without the bullets flying past your head. But without any paint too. That’s right, no paint, the hall was crisp and no paint had been fired yet, we even had to be careful for some freshly painted panels. To get away from that clean look and to get more of a warfare look we turned off some overhead lights and played around a bit with a couple of bare flashes. Just that (obvious) snooted flash with fluorescent gel. 1/60 F4 Iso1000 to catch ambient light. I was limited to 2 flashes (3 PW’s) and didn’t want to get my V2’s out. A mistake. A 3rd light would have given me a lot more options. Is there anyone with experience with those optical triggers ? Do they perform descent in indoor environments (cross light), they could be an alternative while I wait (save) for that 4th PW. And on a side note: the portrait images is scaled down to 500px. I’ll be changing the layout of the blog in the near future so it can hold larger images as well. Love the first picture, the one with the snoot. 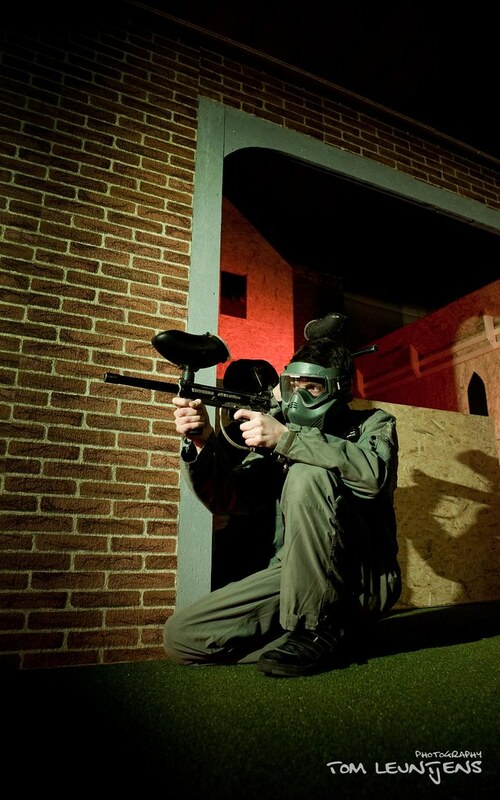 The paintball(victim) really stands out there, and the red gelled strobe in the background really ads to the overall picture!